According to Arsenal’s official website, Sol Campbell has re-signed for the club, and is set to make his second debut tonight for the Gunners’ reserves at West Ham. 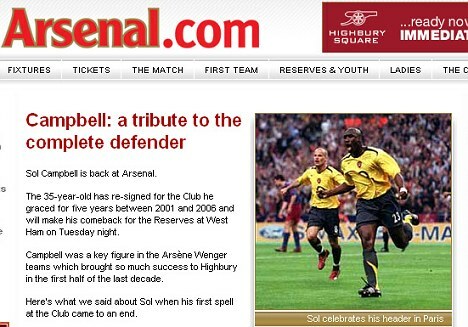 However, the statement has since been removed from the website (it’s back now, albeit only as a brief news line – http://www.arsenal.com/news/news-archive/campbell-named-in-arsenal-reserve-team), prompting confusion and suggestions that it was simply a mistake. That said, the general consensus at time of posting seems to be that it’s more than likely that the mistake was in fact only a matter of timing, and that Campbell will indeed play for Arsenal once more! Madness gone mad – I honestly never thought Arsene Wenger would take a second bite at the 35-year-old defender, whose legs are even more far gone than those of Mikael Silvestre. First thoughts if Sol is on his way back to north London? UPDATE: Sol is indeed listed to play against West Ham’s reserves tonight, “with a view to a permanent deal”. So it’s like a mini trial. Interesting to see how he fares. Personally, I think it’s almost always a mistake to go back, and I also believe Campbell is no longer good enough to cut it at the highest level, but he might be a useful body to have in the squad if injuries cut even deeper. He’s been penciled in for the Reserves squad tonight as a triallist. There’s no way we’d not give a young U-18 Defender a shot at some Reserve Team exposure if we weren’t signing him. As long as he doesn’t bungle catastrophically, he’ll be our new backup defender. The man has an arse like a weather balloon these days!! and I’m sure he’ll be spending a lot of time on it!!! From Notts County to Arsenal….he’s the new Jermaine Pennant!